“Refocusing on charity brought a new energy to my life and my work. I established the David Weekley Family Foundation that same year and began to learn how a nonprofit business operated. I hired a competent COO to run David Weekley Homes and eventually stepped aside so he could be CEO (he has since helped grow this to a $2 billion company). For my family, I banked enough money to cover my three children’s college educations and enough to cover family emergencies, and then decided that 50 percent of my time and salary moving forward would go toward charity.” Read more here. “Piled on top of the business stress was the sense of a missed opportunity. “I had literally millions of dollars flow through my hands, and no good had come out of it,” he remembers. “Money was there and then it was lost, and nothing had changed in terms of the world.” He saw a bumper sticker on the back of a car reading, “God, give me one more million and I won’t screw up the next one.” Weekley was starting to feel the same way.” Read more here. “The concept of Christian Stewardship begins with the understanding that everything we have – all of who we are – comes from God. Deuteronomy 8:17-18 says: Beware lest you say in your heart, “My power and the might of my hand have gotten me with wealth.” You shall remember the Lord your God, for it is He who gives you power to get wealth. This basic understanding is the foundation for our responsibility to give back to humanity in ways that are pleasing to God.” Read more here. “When I was in my early 20s, I heard a speech by a fellow named Stanley Tam. He wrote a little book called God Owns My Business, about being in partnership with God, the idea that what really matters is what we do with what we’ve been given. That’s always resonated with me personally. I look at it like this: I’ve been gifted and blessed with certain skills that have allowed me to create wealth that I don’t necessarily deserve. And I assume that I was gifted with these skills, and the resources they created, because I’m supposed to do something positive with them.” Read more here. The purpose of the William E. Simon Prize for Philanthropic Leadership is to honor philanthropists who are guided by principles such as personal responsibility, resourcefulness, volunteerism, and helping people to help themselves. The Prize is administered by the Philanthropy Roundtable and carries with it a $250,000 award, payable to a charity designated by the honoree. Each year’s recipient is recognized and honored at the Philanthropy Roundtable’s Annual Meeting. Previous prize winners include, John T. Walton, John Templeton, Ben Carson, S. Truett Cathy, & Bernie Marcus. Watch David’s full conversation with Jeff Sandefer here. by Kevin Starr & Laura Hattendorf in the Stanford Social Innovation Review, August 2015. Full text here. by Hope International. Learn more about Hope’s approach here. by Sterling & Associates, 2013. Sterling & Associates can be found here. For many people, fundraising has become a dirty word. Conjuring images of guilt-inducing gimmickry, the predominant model saps the joy from both the donor and the receiver. But what if fundraising has the potential to be good for the giver, not just the recipient? Based upon their own relationship and experiences, The Giver and the Gift outlines a Kingdom perspective on fundraising. Instead of guilt, gratitude. Instead of obligation, joy. Good relationships lie at the heart of every successful organization. Yet no relationship is more important—or more challenging—to navigate than the one between the board and the CEO. In this book, Peter Greer and David Weekley draw from their years of experience to equip board members and organizational leaders to enter into an impactful, life-giving partnership. 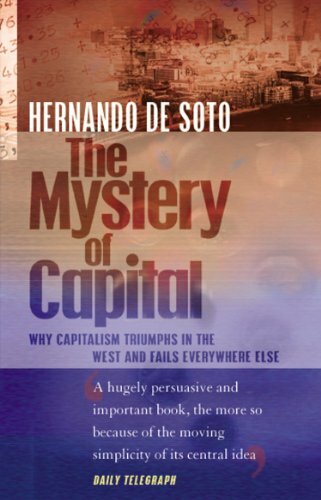 In strong opposition to the popular view that success is determined by cultural differences, De Soto finds that success actually has everything to do with the legal structure of property and property rights. Every developed nation in the world at one time went through the transformation from predominantly informal, extralegal ownership to a formal, unified legal property system. In the West we've forgotten that creating this system is also what allowed people everywhere to leverage property into wealth. The Locust Effect is a gripping journey into the streets and slums where fear is a daily reality for billions of the world's poorest, where safety is secured only for those with money, and where much of our well-intended aid is lost in the daily chaos of violence. The Locust Effect will forever change the way we understand global poverty, and will help secure a safe path to prosperity for the global poor in the 21st century. The White Man’s Burden is a brilliant and blistering indictment of the West’s economic policies for the world’s poor. Sometimes angry, sometimes irreverent, but always clear-eyed and rigorous, Easterly argues that we in the West need to face our own history of ineptitude and draw the proper conclusions, especially at a time when the question of our ability to transplant Western institutions has become one of the most pressing issues we face. When Helping Hurts address the subject of poverty alleviation and ministry to those in need. Emphasizing the poverty of both heart and society, the reader is brought to understand that poverty is much more than simply a lack of financial or material resources and that it takes much more than donations and handouts to solve the problem of poverty. Everyone from Bono to the United Nations is looking for a miracle to bring schooling within reach of the poorest children on Earth. Named after Mahatma Gandhi's phrase for the schools of pre-colonial India, The Beautiful Tree recounts Tooley's journey from the largest shanty town in Africa to the hinterlands of Gansu, China. It introduces readers to the families and teachers who taught him that the poor are not waiting for educational handouts. They are building their own schools and educating themselves. Why do so many organizations wander from their mission, while others remain Mission True? In Mission Drift, Peter Greer and Chris Horst show how to determine whether your organization is in danger of drift. You'll discover what you can do to prevent drift or get back on track and how to protect what matters most. This monograph is a response to questions raised by readers in the social sector of Jim Collins' book, Good to Great. Based on interviews and workshops with over 100 social sector leaders, Collin's reveals the difference between successful organizations is not between the business and the social sector, the difference is between good organizations and great ones. 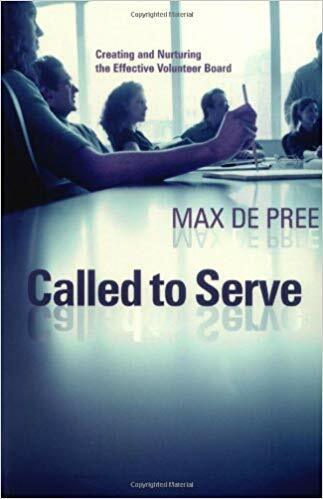 Called to Serve is for people with questions about creating and maintaining a successful nonprofit board. How can the board of a nonprofit organization work best? Now that I'm on such a board, what should I do? How can we find the best trustees? How should I think about my work for nonprofits? What kind of relationship between a board and the staff will work best? How can we organize and develop the service of busy, committed people? "Fundraising is, first and foremost, a ministry," renowned author and teacher Henri Nouwen writes in the introduction. "It's a way of announcing our vision and inviting other people into our mission." Nouwen approaches fundraising from a position of strength rather than weakness, seeing it as spiritual work. "Fundraising is precisely the opposite of begging." How Children Succeed introduces us to a new generation of researchers and educators, who, for the first time, are using the tools of science to peel back the mysteries of character. Tough uncovers the surprising ways in which parents do—and do not—prepare their children for adulthood. And he provides us with new insights into how to improve the lives of children growing up in poverty. Thanks for reviewing these resources! interested in learning more? Send us an email at info@dwf.foundation and we’ll send a few books your way!